All the snow lately has probably got you thinking about one thing: how much you miss fall. Not just the amazing weather and sights of fall itself, but deer hunting too. Fortunately, hunting doesn’t have to end when deer hunting season ends (we’re not talking about poaching either). You can continue your pursuit to become a better hunter throughout the year, and there’s no better time than now for a post season scouting trip. If you’ve ever wondered when to start scouting for deer, you can start immediately after the season closes! Most people don’t think about scouting for deer in December or January, because it’s either too cold or they don’t see the benefit of it. But it’s really an ideal time to wander the woods and learn more about the animal you obsess about during the fall. Plus, it’s some good exercise to keep the holiday treats from sticking to your gut too much. Scouting is one of those deer hunting 101 skills, and every hunter should be doing it to maximize their success rate. Similar to pre-season scouting, you can learn a great deal about the woods and whitetails to help you during your next hunt even if you’re scouting after the season ends. When used in combination with scouting before deer season, however, you can double your knowledge. Pre-season deer will have different movement patterns and behaviors than post season deer. So you should ideally combine these experiences to find the average behavior for your hunting area, and know where to target them as they transition throughout the season. Another nice thing about post season scouting is that you really can’t do any harm from spooking deer. During the pre-season, it’s usually good to sneak around without disturbing bedding areas or alerting deer that you’re there. If you run into a bedded buck, you might hurt your chances at hunting him that season. But you don’t need to worry about that for post season deer. If you jump them from their beds, they’ll run away and have 8 to 9 months to recover from it before you would possibly be able to hunt them again. So feel free to tromp wherever you want. Finally, the post season is a good time to scout because you can find out where the deer have been gathering in the last couple weeks of the season. Especially if there’s snow on the ground, you can easily see where they’ve been feeding, traveling, and bedding in your area. The frozen ground even allows you to inspect some swampy areas where reclusive bucks might hide out during the season. This allows you to set up predictive tree stands next year in the right spots without having to do much more than a quick reconnaissance scouting trip in the fall. The Big Game Tree Stands® Boss Lite fixed position stand is perfect for quickly hanging on one of those trips next fall. This time of year is a good one for clearing new trails or shooting lanes too, since there aren’t any bugs and the temperatures are cool. You have a few options to plan out your scouting trip. You can either use your time to inspect your usual hunting spots and further pinpoint where the deer activity is. Or you could also try a new hunting area you haven’t been to before, to get a feel for the land and check for deer sign there. If you’ve got lots of time, you could easily check out several areas. Plan on a weekend for thoroughly walking a few hundred acres during one of these trips. You can obviously get by with less than a weekend. But if you find yourself crunched for time, you’re not likely to inspect every deer trail you come across that could lead you to a hidden oasis. Many hunters wonder how to find a good hunting spot on public land, and assume it will takes miles of walking to figure this out. 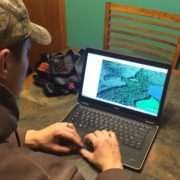 While you do need to walk a bit to confirm things, you should always start your post season scouting with some desktop research before you leave for the woods. You can use any kind of aerial maps for deer hunting purposes as long as you can see satellite imagery and zoom in fairly close. Use them to glance through your hunting area, looking specifically for areas you’d like to target. Identify the food sources and bedding areas you know about, and then locate likely travel routes between them, knowing that mature bucks will often take a very meandering route to stay out of sight. If it’s a completely new area you’re looking at, make your best guess at these spots. Some promising areas to look for include recent clearcuts, agricultural fields, small woodland openings, dense brushy riversides, or thick conifer stands. As far as logistics for one of these post season scouting trips, you should pack light and wear lighter clothing than you think you might need for cold weather. You’ll be very active beating the brush throughout the day, so wearing layers of performance clothing can make a big difference in staying comfortable. You don’t want to sweat, so peel off layers or slow down if you find yourself perspiring too much. You may want to pack along an extra insulation layer or wind-breaking shell jacket in case you get stuck somewhere you don’t intend. If there’s a lot of snow, plan on using gaiters or snowshoes to make the experience more pleasant and keep your feet dry. Otherwise, pack some water and a lunch to keep your energy and hydration up throughout the day. 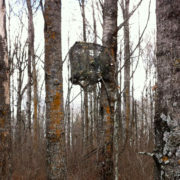 If you haven’t pulled your tree stands down for the season, now is a good time to do it before winter really sets in. If you have lock on stands, make sure you can carry them out with your extra gear. If you mostly have ladder stands, however, you’re going to need to recruit some help to haul them out. Toss a notebook, map, and compass in your bag too so you can record your thoughts and not get lost. It’s also always good to carry along some basic tools, especially if you plan on doing any habitat work. You can easily pack a serrated hand saw or some ratchet shears should you need them. The only caution with post season scouting is to not wait too long. As winter really grabs hold, the temperatures plummet and the snow piles up. Whitetails in many areas tend to migrate to better wintering areas, called deer yards, where there is food nearby and thick cover to protect them from winter winds. Whether they migrate near or far, their patterns will be different. Step into a cedar forest in mid-winter, and it will look like there are hundreds of deer per acre. But the same hot spot will likely be pretty barren during early season deer hunting. The point behind post season scouting is to catch deer patterns while they’re still applicable to hunting season. If you’re still wondering exactly how to scout for deer in the winter, you should start with some high percentage spots to make the rest of the trip successful. As we mentioned above, food sources and bedding areas are great places to start your deer scouting. A whitetail’s world this time of year revolves around these two things. If you’re not sure about where these spots might be or don’t know how to find deer in the woods, start wandering some ATV/snowmobile trails until you cut a track. Either way, you should start looking for deer trails entering and leaving the areas above or crossing the trail. After finding some with buck tracks in them, start the tracking process. If you don’t know how to track a deer for a few hundred yards, you really need to try it. You can discover all kinds of interesting things about deer behavior by learning where they go, what they stop to look at, what trees they browse on, etc. Very often, they will take strange routes that lead you to a new area you wouldn’t expect them to bed, which is great information for next year. Patterning big woods bucks can be challenging, given the vast acreage involved and seeming lack of food. But that’s when following a buck’s trail really pays off. Use your journal and map to record notes on what you find and where you find it. The really critical thing you should look for on one of these post season scouting missions is a good-sized travel corridor you could set a tree stand in. The best tree stand placement for most of the deer season will be concealed along a deer trail. If you’ve been puzzled with how to find a good deer hunting spot before, simply keep an eye out for other deer sign and pinch points as you track your deer from food to bed or vice versa. Finding deep woods bucks is easier when you can see their large tracks in the snow. If you see a history of rubs on the trees along a buck trail, it’s likely that this buck or others have used the same route before. If at any point the trail gets narrow against an opening, a fence line, or a brushy point, you might have found a good place for a tree stand. Particularly if there are mature trees with good cover (e.g., big conifers, oaks, maples, etc. ), you should record the spot as a place to re-visit next fall with a trail camera. That way, you can analyze what kind of deer movement is still there next year before you hunt it. While you’re out post season scouting, you should also keep an eye out for other work you could get finished. For example, if you feel confident you have found one of your new deer hunting spots and will put up a tree stand in a the area next fall, grab those ratchet shears and saw and start pruning out an access trail and shooting lanes to save on the work you’ll have to do next year. It will grow in quite a bit throughout the summer, but there shouldn’t be anything heavy in your way to slow you down. That’s good since you want to remain discreet in the fall and make as little a disturbance as possible. Depending on where you hunt, deer can get spooked by fresh cut trees in the fall. If you’re on private land where you are allowed to cut even more, you may want to consider doing some quick and dirty timber stand improvement to see more deer while hunting. If the property you’re on is lacking in quality winter cover (i.e., consists of mostly mature trees), you may want to consider doing a few quick hinge cuts. Hinge cutting is best done on trees that are 6 to 7 inches in diameter at breast height (dbh). If they are larger than that, you’ll reduce the chance of it hinging properly and make it unsafe to do too. Use your serrated saw to cut halfway through the tree trunk on the opposite side of whichever direction you want it to fall. Gently guide it down as best you can so that it doesn’t break off from the base of the tree. This remaining connection will provide some water and nutrients to the tree top for another year or two, which will keep it alive and producing buds and leaves. Treetops make excellent deer browse in the winter, because the buds and smaller twigs are much softer and more nutritious than coarse, woody growth below. Cutting a tree along a trail produces more food for them as they walk between food and cover, which may even stall them long enough for a shot next fall. But it also helps them this winter by providing some easy-to-reach food and cover. Some good trees to try hinge cutting include maples, basswood, aspens, and beech. This year, don’t miss out on the opportunity to make next deer season more successful. Post season scouting is a good way to spend a winter day, even if you don’t find the perfect spot to hang a tree stand. Use these deer scouting tips to check out some new areas or learn more about your property. Getting back out in nature for a while to explore the woods is never a waste of time.